I used approximately 50gm 8ply (DK) wool in various colours @ 100m (105yd) per 50gm. = SSK, (Slip, Slip, Knit). Slip next st from left hand needle to right hand needle knitways. Slip next st the same way. Return both sts to left hand needle in their new twisted positions and k2tog. = No Stitch. Skip this stitch in the chart and work your next st as the following square. = Make Bobble. Using black, (knit, purl, knit, purl, knit) into the same st, turn, P5, turn, K5, turn, P2tog, p1, p2tog, turn, slip one, knit 2 together, pass slipped st over. which are the instructions linked from my Knitting Patterns and Stitches page. 20sts and 28 rows to 4 inches (10cm) over st st on 4.5mm needles, or needles needed to obtain gauge. Cast on 47sts and work following the chart below. If you aren’t confident about working with both colour and texture, work the chart in plain st st using the intarsia method, and omitting the M1’s at the base of the tree trunk. 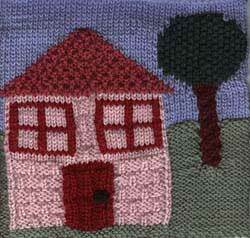 Work the windows using duplicate st embroidery. Cables on the tree trunk are worked thus: slip 2 sts onto cable needle and hold at the back of the work, K2, K2 from cable needle.